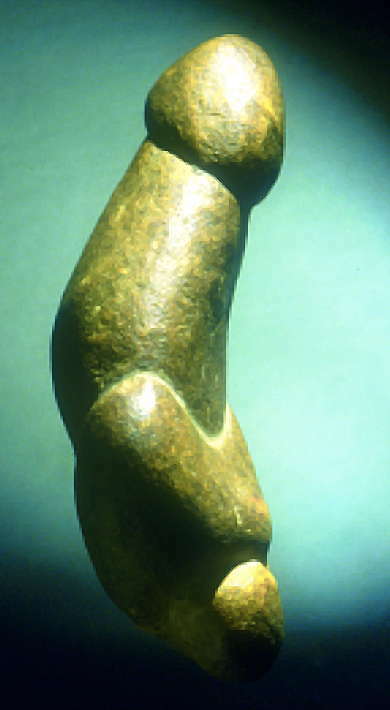 The Venus of Milandes is a phallic shaped venus figure from the Dordogne valley, apparently of Paleolithic age. It was found by a five year old boy in a field, and taken home as one of a number of curiosities found that day. 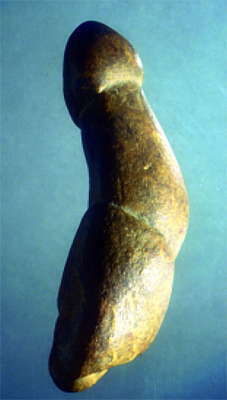 It was shaped from a silicified iron bearing limestone pebble, already with a phallic - feminine shape, and further altered to accentuate this interpretation. The object has a maximum height of 77.3 mm to a maximum width at the hips of 39.0 mm. Its maximum thickness at the hips is 21.5 mm and 19.0 mm at the abdomen. The groove marking the neck has a width of 18.9 mm and a maximum thickness of 15.2 mm. The thickness of the head itself is 17.7 mm, with a maximum width of 21.2 mm. The object weighs about 90 grams. Fig. 3 - Faces A (left) and B (right) of the phalliform female statuette from Milandes. This is the object that Gwen Linnenkamp found in the field. The Venus of Milandes was found by a five year old French boy, Gwen Linnenkamp in the 1980s. He was with his family gathering flint in a field near the Château des Milandes in the Dordogne valley. He picked up objects which caught his fancy, and did not distinguish stone tools from any of the other 'treasures' he collected. Later, when examining his collection, his parents found one of the stones to be of particular interest. A few years later, Gwen Linnenkamp found a second object of the same material and in the same field. Despite the skeptical opinion of their relatives, the family kept the object as a curiosity. The Château des Milandes is a small castle in the commune of Castelnaud-la-Chapelle in the Dordogne département of France. 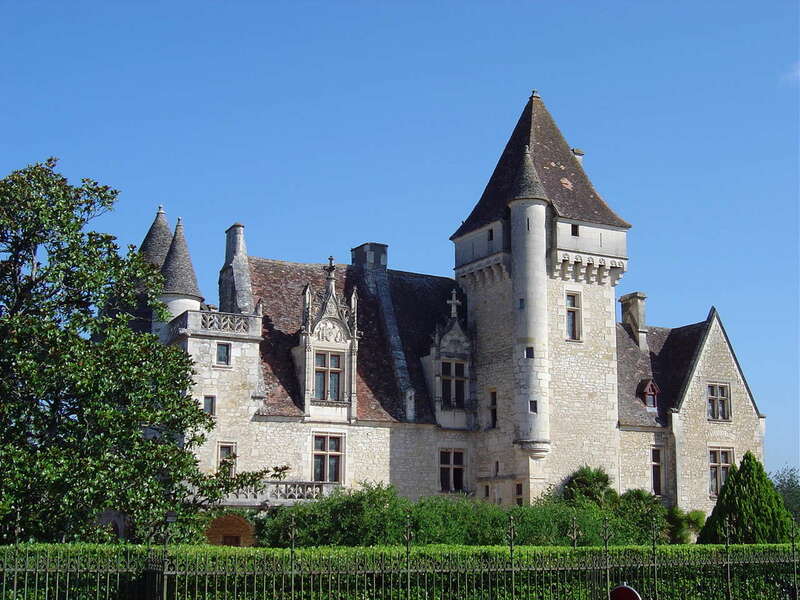 Built around 1489, it was the main house of the lords of Caumont until 1535, who preferred to live in this manor house instead of the large, uncomfortable medieval castle of Château de Castelnaud-la-Chapelle. In 1940, the entertainer Josephine Baker rented the château and then bought it in 1947. Josephine Baker (June 3, 1906 – April 12, 1975) was an American dancer, singer, and actress who found fame in her adopted homeland of France. She was given such nicknames as the 'Bronze Venus', the 'Black Pearl', and the 'Créole Goddess'. When the Germans invaded France, Baker left Paris and went to the Château des Milandes, her home in the south of France, where she had Belgian refugees living with her and others who were eager to help the Free French effort led by Charles de Gaulle from England. As an entertainer, Baker had an excuse for moving around Europe, visiting neutral nations like Portugal, and returning to France. Baker assisted the French Resistance by smuggling secrets written in invisible ink on her sheet music. It was partly in homage to the 'Bronze Venus' that Professor Randall White, noted expert on the Paleolithic, who first described the statuette, named it 'Venus of Milandes'. Finally, in 2001, Gwen Linnenkamp, now an adult, went to the Parc archéologique de Beynac to solicit an opinion on this subject. Laurent Bernat, from the Archaeological Park, showed it to André Morala, a technician at the Musée national de Préhistoire (Les-Eyzies-de-Tayac) who thought that this object was worth further consideration. 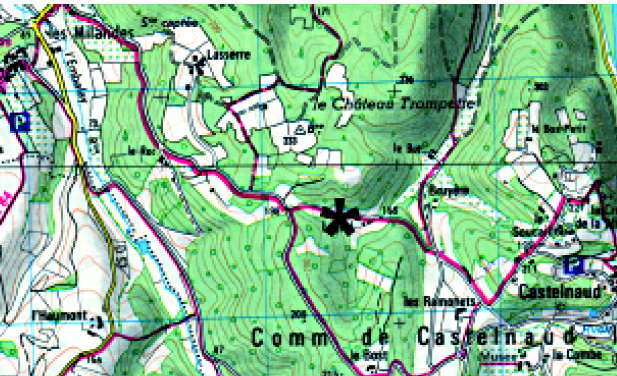 Thus Laurent Bernat came to Professor Randall White, an expert conducting excavations at the Castel-Merle, Vallon des Roches for advice and possibly for analysis and publication. Fig. 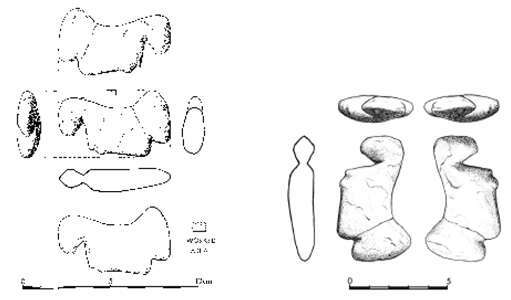 4 - Profile views of the phalliform female statuette from Milandes. Fig. 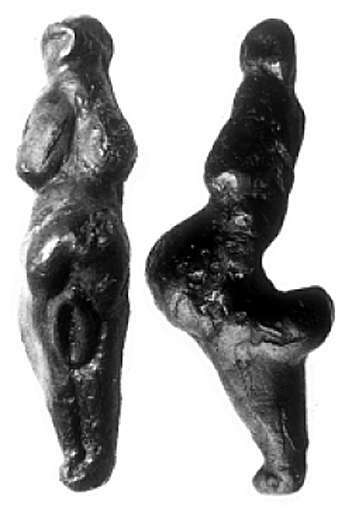 5 - Multiple views of the phalliform female statuette from Milandes. Note especially the view from above. 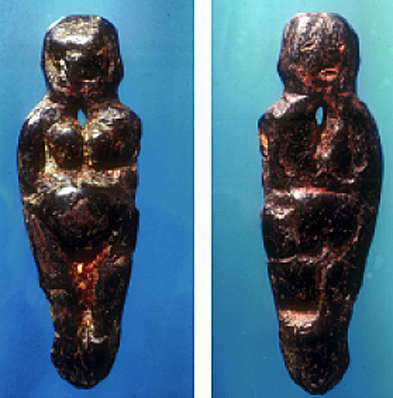 In 1993 White was instrumental in the re-discovery, authentification and publication of a long-missing private collection of seven Ice Age female statuettes from Grimaldi, Italy. This work led him to undertake a massive study of more than 100 Gravettian female statuettes, bringing into focus the techniques used to fabricate them and new directions in their interpretation. 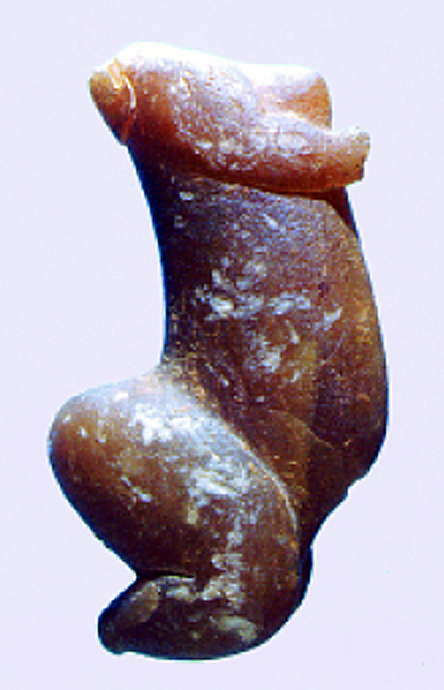 Abstract : A new paleolithic phalliform female statuette 'the Venus of Milandes', (commune de Castelnaud-la-Chapelle, Dordogne). 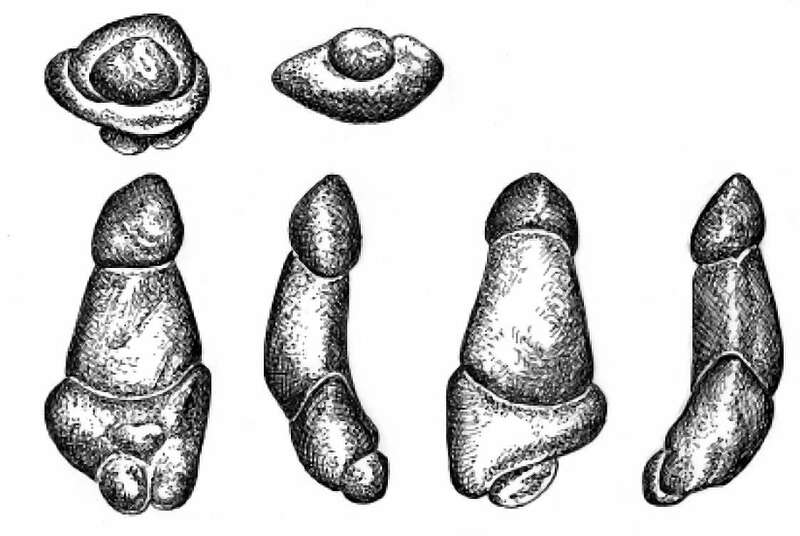 The author describes and analyses a phalliform female statuette found in the early 1980’s in the Dordogne Valley. In spite of the fact that it was found out of context in a cultivated field, several lines of argument permit us to attribute it to the Upper Paleolithic. 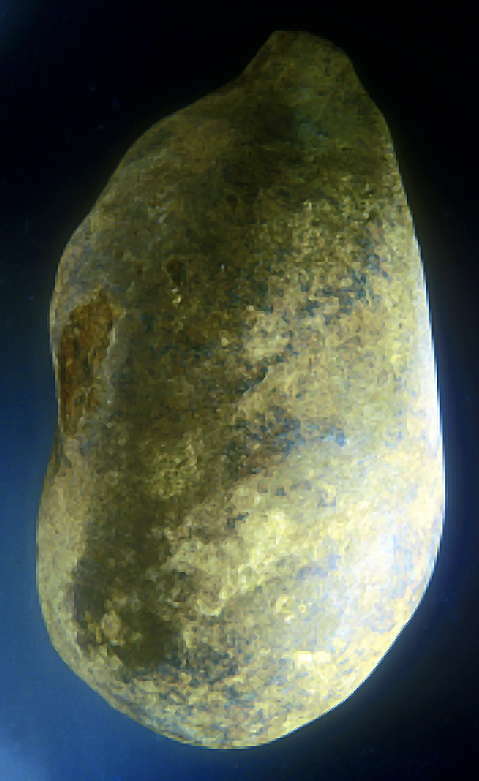 A detailed microscopic and technological analysis, as well as comparisons with other Paleolithic statuettes that the author calls “sculptures on suggestive supports”, leads him to consider the object to be authentic and probably of Gravettian-Protomagdalenian age. Three interpretive readings are proposed. 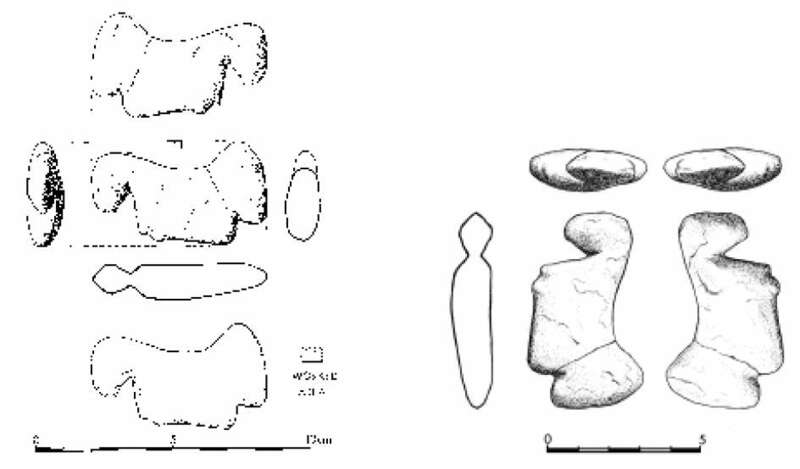 We present a description and analysis of an anthropomorphic shaped object found by chance in the 1980s by Gwen Linnenkamp, ​​then a young boy, accompanying his family to gather flint in a field near the castle of Milandes (Valley of the Dordogne). Gwen Linnenkamp, who was five at the time, did not distinguish stone tools from other objects he found interesting. By examining his collection, his parents found one of the stones to be of particular interest. A few years later, Gwen Linnenkamp found a second object (which will be discussed below) of the same material and in the same field. Despite the skeptical opinion of their relatives, the family kept the object as a curiosity. 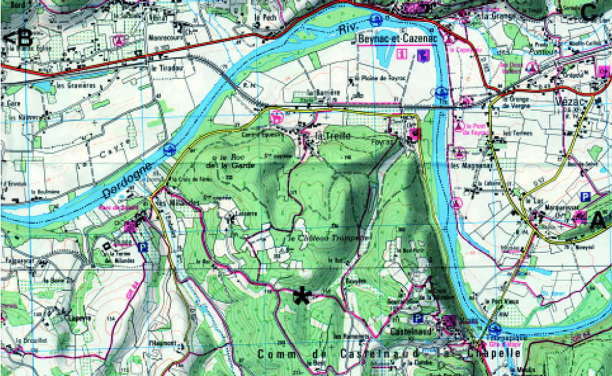 Finally, in 2001, Gwen, now an adult, went to the Parc archéologique de Beynac to solicit an opinion on this subject. Laurent Bernat, from the Archaeological Park, showed it to André Morala, a technician at the Musée national de Préhistoire (Les-Eyzies-de-Tayac) who thought that this object was worth further consideration. Thus Laurent Bernat came to us for advice and possibly for analysis and publication. During our first examination of this object, our attitude was extremely cautious. If we conclude here that this is a real statue, it is because we have submitted it to numerous tests with the objective to identify characters which would indicate fraud or natural accident. A series of macro and microscopic analysis convinced us of its analogy with a female form, its authenticity and its attribution to a prehistoric era. 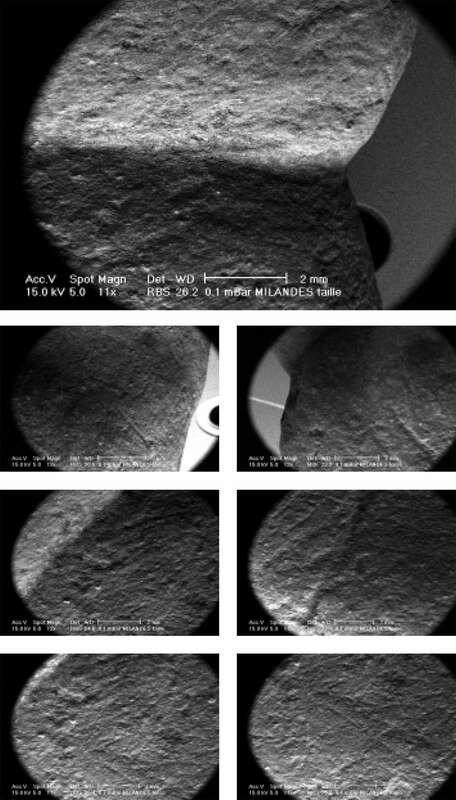 We went to great lengths to try to find the slightest evidence showing that this object does not have the character of a prehistoric statuette: optical microscopy, scanning electron microscopy, experimentation, and X-ray diffraction technique and morphological comparison with other female statuettes in mineral matter. This review convinced us that this was an anthropomorphic statuette, probably from the Upper Paleolithic. The second result of our approach was to outline the criteria for recognition of human intervention on such objects (see below). On the Road to Castelnaud aux Milandes, on the left bank of Dordogne, just before the hamlet of Milandes, a small local road goes left uphill on the right flank of the valley of the Embalay. A few hundred metres further on, the road leads towards the east by a valley that leads to the plateau between Milandes and Castelnaud. At the top of the plateau, the valley is joined by others, including one which goes down to Castelnaud. This locality, called Leyral, is at an altitude of 170 metres, at the bottom of the valley in question. North of Leyral, this small valley is dominated by a hill on which outcrops late Cretaceous ferruginous limestone. The highest point of this hill is at 233 metres altitude. We were able to examine some flint in the possession of the discoverer, and which came from the vicinity of the statuette. There was nothing from the typical Upper Paleolithic, but rather it was Mousterian as is most often the case for open-air sites on the plateaus of the Dordogne valley. IGN topographic map (1/25000) showing the discovery location and surrounding area. The asterisk indicates the approximate discovery location of the statuette. In our view, this object evokes the female form. The object has a maximum height of 77.3 mm to a maximum width at the hips of 39.0 mm. Its maximum thickness at the hips is 21.5 mm and 19.0 mm at the abdomen. The groove marking the neck has a width of 18.9 mm and a maximum thickness of 15.2 mm. The thickness of the head itself is 17.7 mm, with a maximum width of 21.2 mm. The object weighs about 90 grams. Fig. 3 - Faces A (left) and B (right) of the phalliform female statuette from Milandes. 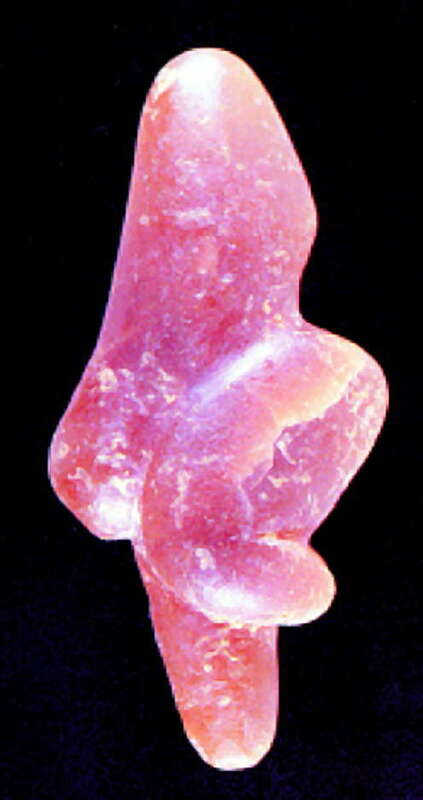 The material of the statuette corresponds to small nodules of silicified limestone in an oblong shape. Its geological origin, probably local, can be found in the Upper Cretaceous. At the foot of the limestone cliffs which form the relief, and in the surrounding valleys are deposits with numerous flint nodules at various stages of silicification. These nodules have high surface alterations indicating fairly aggressive conditions of transport, as well as tan-brown ferruginous crusts resulting from their origin in the iron rich tertiary formations. 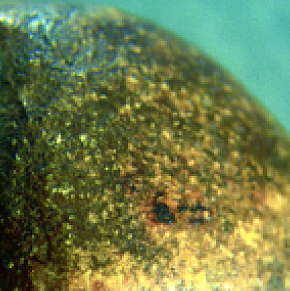 These characters are actually observable in this nodule: differential distribution of silica, sometimes more concentrated locally, and, in many ways, the presence of small inclusions of hematite, including the head (fig. 20) and 'legs'. Below Leyral, towards the east, a road cutting gave us a number of small nodules of various shapes and highly weathered boulders. Amongst these materials composing the slopes of the valley there were a few nodules that seem comparable to the material of which the statuette is composed. 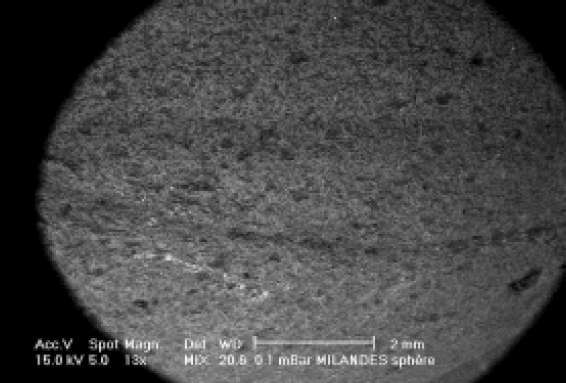 We were able to perform analysis of X-ray diffraction in the Research Laboratory of the Museums of France in Paris. Indeed, the experimental spectrum of the nodule (fig. 6) is very similar that of the statuette. 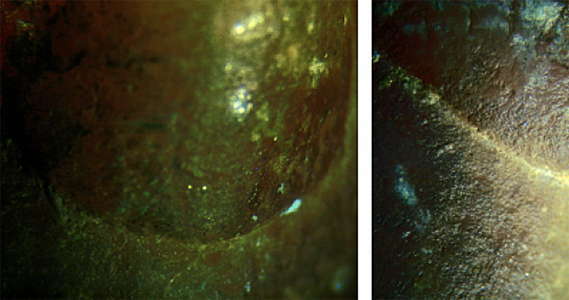 The amount of carbon is higher for the statuette, perhaps due to the handling of the latter during almost twenty years. We were able to perform some experiments on these nodules (fig. 7). These results were satisfactory. On one side, we began a process of manual abrasion using a piece of sandstone. After thirty minutes, we saw the same glossy surface of that of the statuette. 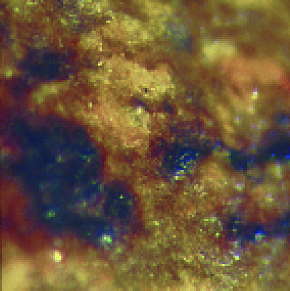 Microscopically, the surface features (color, lustre, chaotic abrasion scars, the presence of hematite) are very similar. As with the statuette, abrasion left only a few marks (fig. 18), reflecting the hardness of the material. As for the statue, the contoured shape and evocative nature of the original nodule required the sculptor to make only a small adjustment of size and contours to give it its final shape. We believe, however, that even if the shape of the statuette was more or less pre-existing, some hours were necessary to remove the surface crust and reach the final shape using other methods. Fig. 7 - Experimentation using a nodule found not far from the discovery location. Given its sound design, the layout of the work shows engraving, scraping, and abrasion. 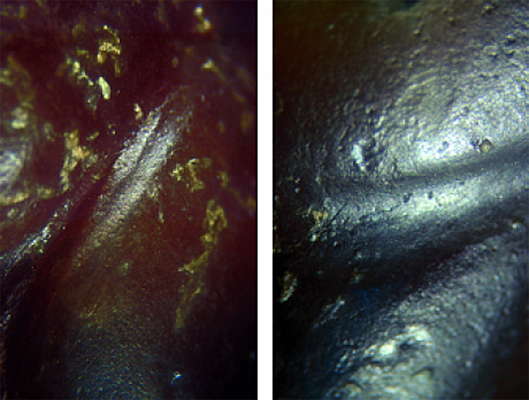 The examination under a binocular microscope of the worked surfaces testifies to these different surface treatment operations. The result obtained is interpreted as the expression of a synthetic combination intimately combining two forms, one female, the other phallic. As discussed below, the Paleolithic of the Perigord used as a material pebbles which had an original form suggestive of a desired shape. For us, this class of objects should be distinguished as the "sculptures on suggestive media"
The head is clearly phallic in shape, is delineated from the body by a sub horizontal groove. This marks the neck (in case of a head) or the limit of the glans (where a phallus is intended). The head-phallus has a smooth surface and no detail of the face is visible, either on one side or on the other. One side of the head is flat, the other is convex. The top of the head is slightly beveled. The arms and breasts are not represented. The statuette is spotted because of different mineral inclusions observed on the surface. The colour ranges from beige-orange and grey and it is not impossible that some of the gradations of colour play a role in visual perception of the object as they sometimes seem to highlight certain engraved features. To the naked eye, the surface is shiny and polished. Especially on the A side, (fig. 3), there are traces of scratching. 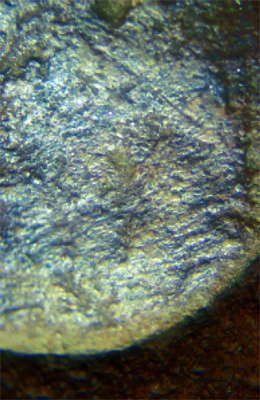 The other tool marks, fairly numerous, are much more discreet, but are easily visible under a microscope. 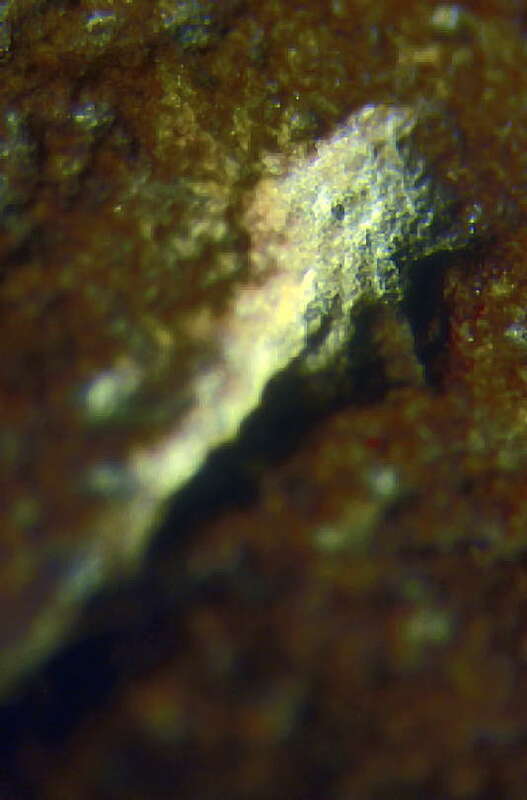 The statuette, even if it was discovered fifteen years ago, and probably washed by its discoverers, still has residues of sediment and rootlets (fig. 9, 10) that we have not removed in the hope that it might give some indication of its context of origin and authenticity. Our experience (White 1992a) on false statuettes shows that they are clean. Real statuettes, in museums (eg, the Grimaldi venuses), always have sediments in the hollows. Indeed, a carved piece buried for say 25 000 years, even if it is fully washed, would not fool careful scrutiny under the microscope. This is the case here, where sediment and micro-roots are present, especially in the case of face B (fig. 3 and 19). In some cases, notably the atrophied legs, it is possible that the incisions are natural features of the original pebble (fig. 9 and 10). However, most of the cuts and lines are clearly of human origin. They are quite clean and they have the same slight patina. On several points, the statue has marks on the surface from tools and other procedures. What we interpret as evidence of scratching with a sharp tool (fig. 12) occurs on the face A of the object and are visible even to the naked eye. The possibility that these are traces of agricultural origin (for example from a plough) seems excluded by the fact that they are weathered. This patina is in stark contrast with traces of recent damage, clear and obvious (not weathered), found on the Venus de Sireuil, for example. On the surface of the substrate which were originally concave, the lines often have a more or less symmetrical V-shaped profile more or less symmetrical (fig. 11, 14, 15, 19). On the convex surfaces of the substrate, but also sometimes on concave surfaces, the features often have a V-shaped, asymmetric profile which gives a false relief (Fig. 13). The edge of the more oblique of these asymmetric features is, in many places, softened by scraping (Fig. 13). 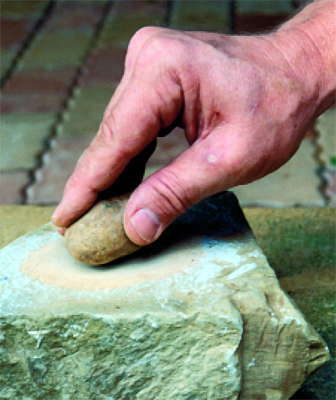 This technique is used, for example, by Rigaud (1982) for the 'femme à la corne' of Laussel. 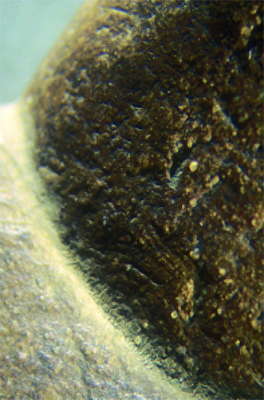 Microscopically, one sees on the surface of the statuette a fairly high density of striations oriented in several directions and often intersecting (fig. 11, 12, 15, 16 and 17).There are inclusions of haematite, particularly marked in two places: on the head and one of the spherical reliefs that form the base of the object. We mentioned that Gwen Linnenkamp had picked up a second object in the same field, and we were able to examine it carefully. 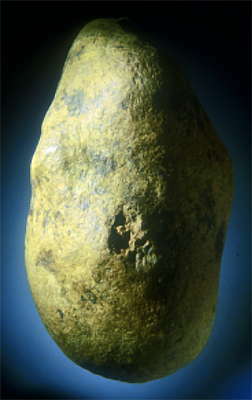 It is a spherical nodule (maximum diameter of 27.5 mm) with a glossy surface (fig 21, 22), made of the same material as that of the statuette. On one end, there is a small prominence and there is a crack in the material that gives the illusion of an engraved line. This latter has nothing to do with the incisions observed on the statue and its fringes are tinted red by hematite contained in the material of which it is made. If the statuette of Milandes and the second object were both naturally occurring, we would expect to see the same surface morphology. However, in contrast with the statuette, a meticulous examination by light microscopy and scanning electron microscope revealed no stigma, not even the slightest streak of abrasion. With caution, we suspect that this pebble is quite natural and could be a very advanced state of erosion specific to this type of nodule. In fact, the smooth surface suggests that the original material of the statuette had been lustrous. Finally, as a precaution, we had the idea of interviewing two amateurs who have prospected the cultivated fields of Perigord noir (collecting flint) for over fifty years to see if they had observed natural nodules resembling those two objects. Their final answer was: if some siliceous nodules had a suggestive shape, their surfaces are not glossy. So, until the first discovery of this kind, we have no indication of the existence of natural features similar to the Milandes objects. Fig. 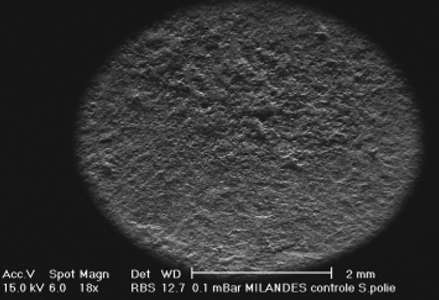 8 - At left, the original rough surface of the nodule. At right, after 30 minutes of abrasion lustrous zones began to appear. Fig. 16 (top photo) - Scanning Electron Microscope image of the waistline on face A showing converging grooves. Fig. 17 (bottom six photos) - Scanning Electron Microscope images of several locations on face A above the waistline. Fig. 18 - Experimental nodule. Scanning Electron Microscope image of the surface, after 30 minutes of abrasion. Note the fine stigmata of abrasion in the bottom half of the image. Fig. 19 - Waistline on face B (18x) . Right : its surface, with a total absence of stigmata, at 18x. Fig. 22 - Scanning Electron Microscope image of the surface of the spherical nodule showing the absence of stigmata. Sculptures of women from Perigord sites are few in number and are not at all typical of European feminine sculptures and are very diverse. In all cases (except perhaps Laussel), if they had been found outside of an archaeological context , their allocation to the Paleolithic would be as problematic as in the case of Milandes. To better assess the marks observed on the statue of Milandes, we conducted a morphological analysis and microscopic four "media sculptures suggestive" for comparison: Tursac , Sireuil, Pataud and Monpazier. As to their form, these objects are very different from each other. But what they have in common is that all four seem to have been carved from a pebble, which already suggested the natural female form before being worked. The analysis of these statuettes brought us some surprises. 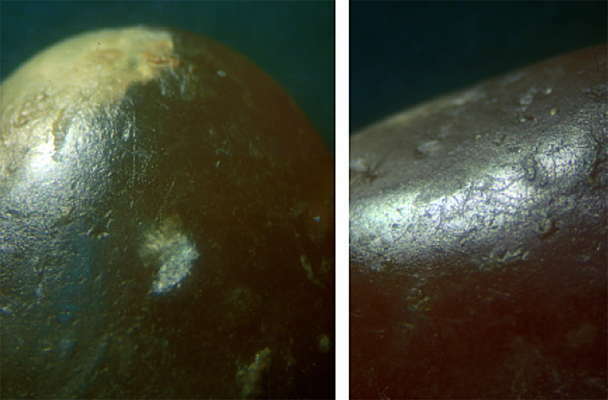 Having previously studied the marks of tools on the statues of steatite (soapstone, talc) and serpentine from Grimaldi, we expected to see traces of the same kinds of marks from sharp flint associated with streaks of abrasion. But as we shall see, on some of the known statuettes, including those from archaeological contexts, some were worked in such a way that the marks are subtle or even absent. Our attention was particularly drawn to an object from level 2 of the protomagdalénien Abri Pataud (AP/63 2-1964) found near human female remains. This layer has delivered several C14 dates, of which Movius accepted 21.940 ± 250. 1975:9, Movius 1977:28He interpreted this object as a sculpture in the shape of an animal (fig. 23). For us, it is quite possible that this reading is valid, but there is another parallel reading that seems even more convincing. It would actually be a female statuette. If the illustration of Movius is rotated 90 degrees, a feminine image seems obvious (fig. 23 and 24), which shows an image with some similarities with the design of the Milandes statuette . Again, this is a natural object, already similar to the representation of a female. Having been able to study the object at the Movius museum we are convinced that this is the case . This is a flat pebble of chalky limestone. There is a minimum of work done to better show the head, breasts, abdomen and legs. The arched back seems completely natural. The worked area (of fig. 23) shows only traces of scraping to change the contours of the support. 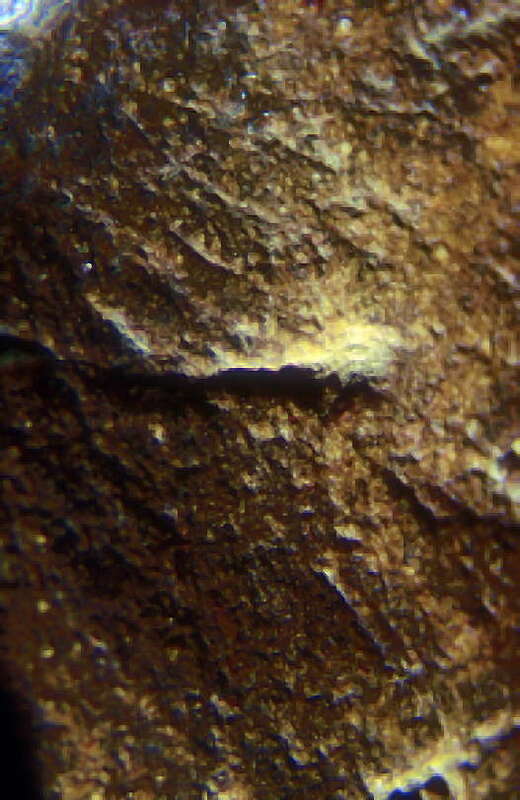 No incision or other stigmata of a lithic tool is visible. The rest of the surface of the object is characterised by the total absence of human interference. It is 8.1 cm high, roughly the same size as that of Milandes. It has the same smooth contours, partly natural, and the same arched back. In addition, some researchers (Delporte 1960, 1968)saw a phallus in the part of the statue which goes down between the folded legs. We undertook microscopic analysis of the Tursac Venus. Apart from a few very fine and superficial scratches on some of the surfaces and streaks of scratching from the erasure of marking ink, this statue shows an almost complete absence of evidence of shaping. Yet she was found in a rock solid context, and the form also leaves no doubt that this is a prehistoric sculpture. It was formed almost solely by abrasion and polishing. and not, as we assumed, by the techniques of scraping and cutting with flint tools. We were especially struck by what could be taken (to the naked eye) for incisions which put in relief, for example, the thighs against the abdomen. But in fact these are not incisions in the usual sense, made with a sharp flint. 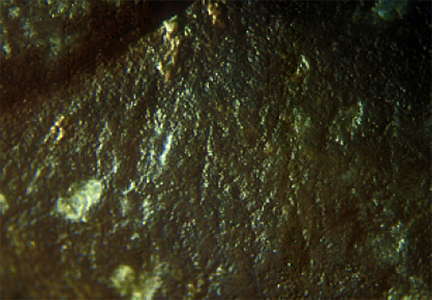 Rather, the grooves were created by an abrasive tool to round the contours. The method used was more like that of a file. The base of these grooves bear no streaks of abrasion, but sometimes we see the intersection of two distinct furrows (Fig. 27) as if there was a change in the angle of application. Reassuringly, we see precisely the same thing on the statue of Milandes (Fig. 16) In short, if this object was found in a field outside an archaeological context, it could not seek to verify its authenticity by the marks of flint tools. It would have to be identified, or not, by its form. Fig. 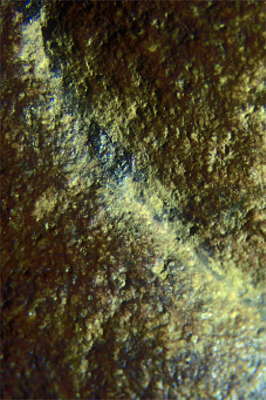 26 - The surface of the Venus of Tursac. 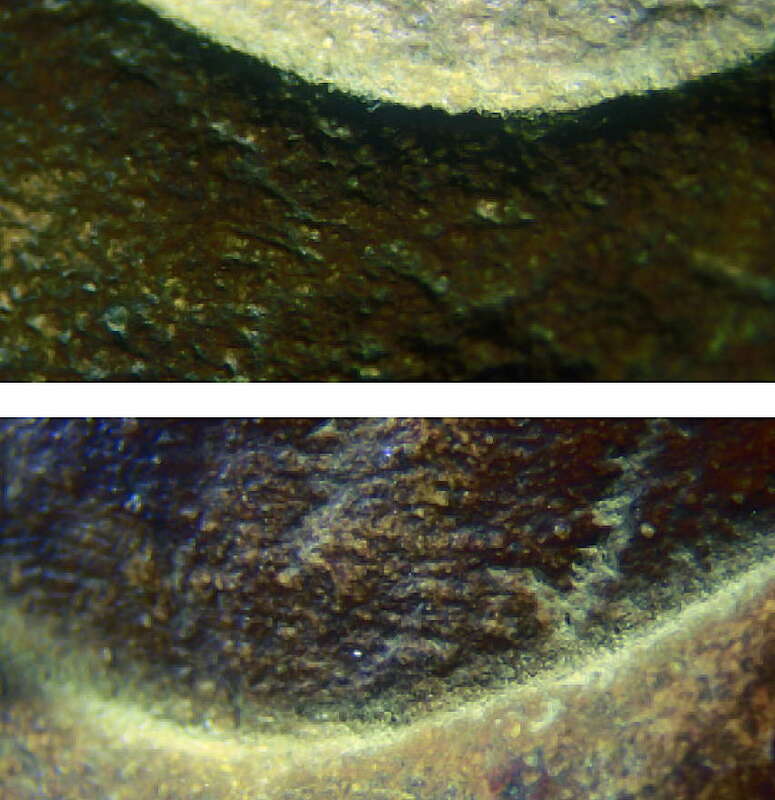 Traces of polishing are nearly absent and when they exist, they are extremely fine and superficial (6.4x). Fig. 27 - The Vénus of Tursac. At left, the limit between the abdomen and the left thigh. Two converging grooves are visible. At right, details of the grooves showing the rounded and featureless bottoms. Compare with fig. 16 (6.4x and 18x). There is some convergence in this small sample of examples. We note especially their variability and originality, both technical and morphological. These observations allow us to offer an array of different characteristics of female statuettes from the Périgord, including that of Milandes (table 1). Table 1 - Authenticity criteria based on the analysis of different Périgord female statuettes (in stone). Having excluded the possibility that the object of Milandes is anything but a prehistoric statue, we offer a number of interpretations. 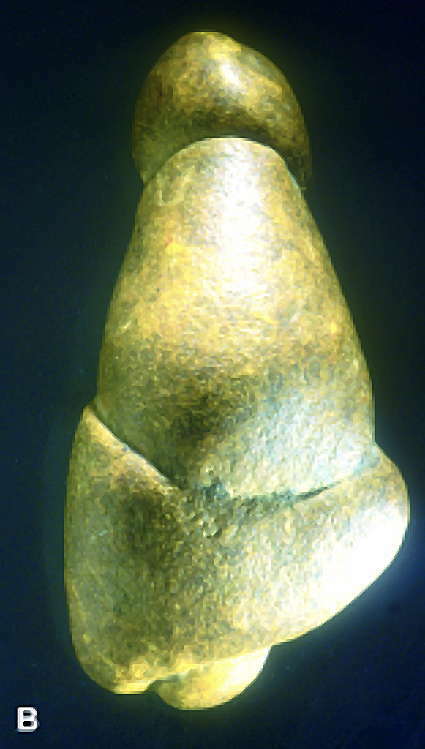 Apart from the head-phallus that seems pretty obvious and relevant to the interpretation, at least three readings of this object are possible because of the ambiguity of the form found in other Upper Paleolithic female statuettes such as some of the Grimaldi, and especially that of Lespugue (Coppens 1989). Interpretation 1: the curved face (face B) is the back of a female figure. Below the neck, the sculpture expands, giving the impression of rounded shoulders, with head bowed down, a posture often recognized in Gravettian female statuettes. The back is arched, the chest is concave. In this case, the incision above the belly (face B) marks the crease between the breast and the stomach. Seen from above, the concavity above and below the incision emphasises the protrusion of the convex lower abdomen. What can be regarded as atrophied legs consists of two small spheres which are joined, separated by a groove. They are asymmetric from left to right and front to back. On the upper legs, the groove divides to delineate the crotch, and to mark the lower abdomen, the pubic triangle and the valley between the thighs. Under this interpretation, the surface of the face is flattened in profile, the sub-horizontal line of the neck corresponds, in a fairly realistic way, the morphology of the neck. Interpretation 2: the concave side (side A) is the back of a female figure. According to this reading, the chest and abdomen of the subject would be projected forward, displaying a round belly. However, under the line which marks the lower abdomen, a mass could be interpreted as the convex front of the thighs, but they are not separated by a midline incision and are unconvincing. By taking the liberty to ignore this fact, the two spheres are always interpreted as the lower legs, but there is no angle etched to define a pubic triangle. In this case, a light-colored siliceous inclusion, continuing beyond the incision crotch, can give the illusion of the pubic triangle, an idea difficult to confirm. According to this interpretation, the view of the back is much more convincing. The lower back is very arched. Under the line of the waist, descending, is a kind of depression above the buttocks (often present in the female statuettes throughout Europe), followed by a mild prominence representing the buttocks themselves. The interpretation of the atrophied legs is still valid. In trying to understand this strange sculpture and comparing it to a hundred other statues we studied, we find that the line forming the waist is concave on both sides. This style of representing the waist engraved with a continuous line is typical of Gravettian and Epigravettian figurines, but only for the view of the back. So the third possible reading, and one that seems most credible, is that the object is two opposing views of the back, while admitting that this reading is an unusual representation. Indeed, if we accept this perspective, we have two half-statues that correspond well to what can be seen at the back of most other Paleolithic female statuettes. The profile views correspond well to three readings. The lack of breasts adds ambiguity given the phallic aspect of the head. In view of the gluteal morphology (an adult), it is implausible to explain the absence of breasts by the fact that this is an adolescent. Ultimately, we believe that the three readings are valid. The female statuettes are often anatomically ambiguous. The Venus of Lespugue (fig. 34 (2) ), as noted by Coppens (1989), observed from the back, can be rotated 180 degrees to reveal a second woman with different hair. In Grimaldi, three statues show the trend. The woman with a hole in the neck (fig 34 (5 and 6)) has two faces and one body. The woman with goitre (fig. 34 (3 and 4)) has only one torso and one head, but underneath, she has two pubic triangles and two opposite legs. The woman with two heads (White 1995: fig 1; White et Bisson 1998), as its name suggests, has two opposite heads but one body. A final example is from Avdeevo in Russia, where two ivory statuettes (fig. 34 (1)), of very different design, were found nested head to tail. Fig. 34 (1): Avdeevo double venus back to back. Fig. 34 (3 and 4): The two faces of the woman with goitre, Grimaldi. Fig. 34 (5 and 6): The two faces of the woman with the perforated neck, Grimaldi. The originality of the Venus of Milandes resides in the blatant phallic shape of the head. In relation to this character, precise comparisons with other Paleolithic female statuettes are not obvious. The first observation is that hand-held, the object first appears genuine. This is a rather subjective, but important, assessment of its authenticity. Having been able to manipulate and study more than a hundred Paleolithic statuettes, our sense leads us to consider this statue as prehistoric. 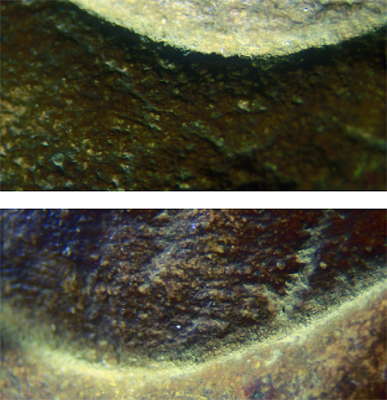 In addition, all the morphological data, microscopic and technology presented here argue for authenticity: the morphology of the object, the ambiguity of its interpretation, the patina of its surface, the V-profile tracks slightly eroded by abrasion, comparison with other recent Périgord statuettes, the remains of sediment and plant filaments. But one is especially struck by the complexity and originality of the design, created by a few well controlled shaping techniques. This escapes most counterfeiters. Finally, the circumstances of the discovery and the attitude of the discoverers argue against a hoax. It is an object picked up by a naive child and kept by his parents because of its curious shape. In my discussions with the discoverers, no deception or motives of financial gain was evident. To say that an object is from the prehistoric is far from assigning to it a precise time. 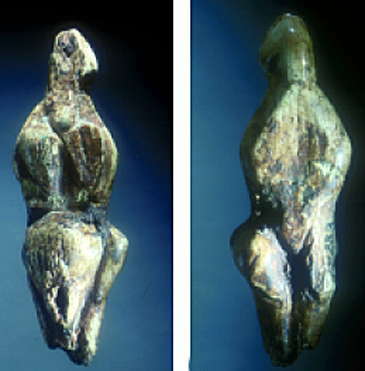 It is unlikely that the Venus of Milandes is post-Paleolithic because such objects are, to our knowledge, unknown in the South West of France. We have discussed it in reference to the Gravettian and Protomagdalénien (in the sense that Peyrony used it) because it is for those times that there are rather convincing points of comparison. We do not see similar examples in the Magdalenian or Solutrean, even if the phallic aspect is more pronounced for the sculptures of these periods than the Gravettian. We exclude the possibility of attribution to the Aurignacian because Aurignacian statuettes as such are simply unknown in Aquitaine. Of course, it is possible that this is a rare or unique piece from the Neolithic, or the Aurignacian. But one is obliged to form comparisons on current knowledge: by its form, the nature of the material and the spirit of its design, the statuette of Milandes is more consistent with similar examples dated or attributed to the Gravettian-Protomagdalenian . In Périgord, female statuettes of carved stone have quite diverse shapes, which could perhaps be explained by the difference in the shape of the natural stones chosen as raw material. The statuette of Milandes is the only one that is frankly phallic, even though the Venus of Tursac has been interpreted as androgynous. The only characteristic that all these statues have in common is the arched back posture and belly thrust forward, a posture uncommon among female statuettes from other parts of Europe. In summary, we think we are confronted by a new phallo-feminine statuette, probably from the Gravettian-Protomagdalenian. Despite the reservations we have often expressed regarding the use of 'Venus' for female statuettes (Bisson et White 1996, White et Bisson 1998), we named this sculpture, found 500 metres from the former residence of Josephine Baker, 'the Venus of Milandes'. The coincidence was too good! We hope that further research in the field will give further contextual guidance. We thank Gwen Linnenkamp and his family, Serge, Michelle et Isabelle Castanet, Laurent Bernat, André Morala, Jean-Phillipe Rigaud, Jean Jacques Cleyet-Merle, Nicolas Audebert, Vincent Dimenet, Alain Roussot, Jean Rodier, Philippe Walter, Norbert Aujoulat, Guy Célérier, Jean Clottes, Patrick Perrin and Roland Nespoulet for their assistance in this study. I want to dedicate this paper to the memory of Henri Delporte who transmitted to me his passion for Paleolithic feminine images. Bisson, M. et White, R. , 1996: L’imagerie féminine du Paléolithique : Etude des figurines de Grimaldi. Culture, 16: pp. 5-64. Breuil, H. et Peyrony, D., 1930: Statuette féminine aurignacienne de Sireuil. Revue Anthropologique, 40 : 44-47. Coppens, Y., 1989: L’ambiguïté des doubles vénus du Gravettien de France. Comptes rendues des séances de l’Académie des Inscriptions et Belles-Lettres. Paris : Boccard. Clottes, J., 1971: La découverte d’une statuette féminine paléolithique à Monpazier. Bull. de la Soc. Preh. Ariège-Pyrénées. 26 : 77-82. 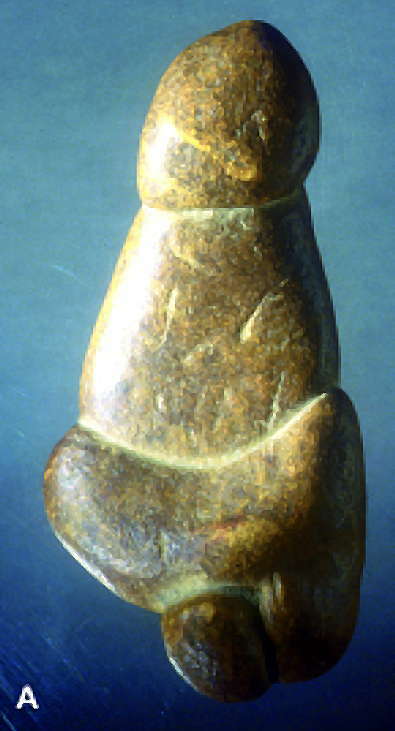 Clottes, J. et Cerou, E., 1970: La statuette féminine de Monpazier (Dordogne). Bull. de la Soc. Préh. Fr. 67. Delluc, B. et G., 2000: La Vénus sculptée de l’abri Pataud (Les Eyzies) : oui ! Bull. Soc. Hist. Arch. Périgord, 127 : 43-72. Delporte, H., 1959: Une nouvelle statuette paléolithique: la Vénus de Tursac. L'Anthropologie, 63 : 232-245. Delporte, H., 1960: Problèmes d’interprétation de la Vénus de Tursac. Quartär 12 : 119-129. Delporte, H., 1968: L’abri du Facteur à Tursac (Dordogne). Gallia Préhistoire, XI : 1-145. Delporte, H., 1993: L’Image de la femme dans l’art préhistorique. Paris: Picard. Movius, H., 1975: Excavations of the Abri Pataud, Les Eyzies (Dordogne). Cambridge: American School of Prehistoric Research, Bulletin 30. Movius, H., 1977: Excavations of the Abri Pataud, Les Eyzies (Dordogne). Cambridge: American School of Prehistoric Research, Bulletin 31. Rigaud, J.-Ph., 1982: Le Paléolithique en Sud-Ouest Sarladais. Nouvelles données. Thèse d’État. Université de Bordeaux I.
Roussot, A., 1995: Connus et inconnus sur les femmes de Laussel. La dame de Brassempouy. Liège : ERAUL 74, pp. 221-238. Sonneville-Bordes, D. de, 1960: Le Paléolithique supérieur en Périgord. Bordeaux : Delmas. White, R., 1992a: Une Vénus problématique trouvée au Minneapolis Institute of Arts, Minneapolis, Minnesota, USA. Bull. de la Soc. Préh. Fr. 89:282-288. White, R., 1992b: Bone, antler and ivory objects from Abri Blanchard, commune de Sergeac (Dordogne), France. French Paleolithic Collections in the Logan Museum of Anthropology, Beloit College. R. White and L. Breitborde (eds.). Beloit, Wisconsin: Bulletin of the Logan Museum of Anthropology, New Series, 1(2), pp. 97-120. White, R., 1995: Les images féminines paléolithiques : un coup d’oeil sur quelques perspectives américaines. La dame de Brassempouy. Liège : ERAUL 74, pp. 285-298. White, R. et Bisson, M., 1998: Imagerie féminine du Paléolithique. L’apport des nouvelles statuettes de Grimaldi. Gallia Préhistoire, 40:95-132.